This Award Winning DVD features the recorded audio tales of tabletop roleplayers as they play through two of the greatest campaigns for Chaosium's CALL OF CTHULHU roleplaying game. 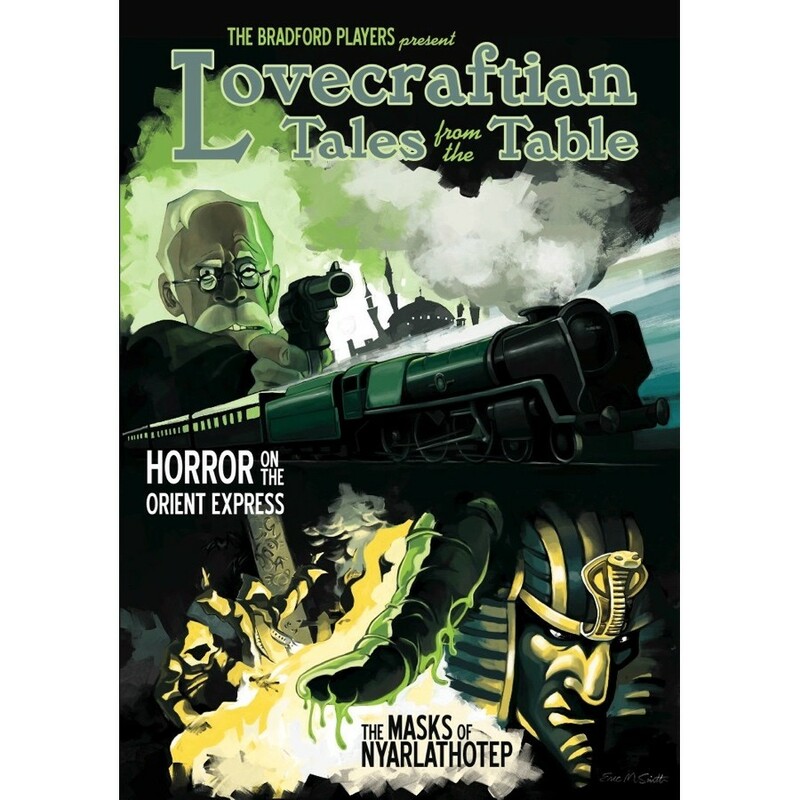 Join the BRADFORD PLAYERS in their epic adventures (and mis-adventures) through HORROR ON THE ORIENT EXPRESS and the MASKS OF NYARLATHOTEP. Roleplaying games have been around for many years, people getting together to take part in games of the imagination, whether of fantasy, the far future, horror or any other setting you can imagine. So come pull up a chair at the Bradford Players' table and see just what fun these games can be! This DVD-ROM was made in celebration of 10 years of YOG-SOTHOTH.COM and over a quarter century of the Call of Cthulhu roleplaying game. UK Games Expo Award Winner 2009. Both HotOE & Masks games at the highest quality MP3s available. Many hours of entertainment audio. Interviews with the game and adventure developers including Sandy Petersen (Call of Cthulhu), Greg Stafford (founder of Chaosium), Charlie Krank (former Head of Chaosium), Larry DiTillio (Masks of Nyarlathotep) and members of the Cthulhu Conglomerate (authors of Horror on the Orient Express). Quick Start Start Guide to Call of Cthulhu and PDF character sheets. Music by Alex Otterlei (HotOE) and Darkest of the Hillside Thickets. Photo Gallery and Player & Keeper interviews. Prop Documents by the H.P. Lovecraft Historical Society. Artwork by Earl Geier, Eric M. Smith, Francois Launet and others. "Best of" Yog Radio (including interviews with Robin "Wicker Man" Hardy & Bob "Dr. Phibes" Fuest). Post-game discussions by the players of both HotOE and Masks. Videos, handouts, previously unreleased extras and easter eggs! The Freeport Trilogy and Cults of Freeport gaming supplements by Green Ronin Publishing. 8 page full colour DVD booklet designed by the HPLHS. A platter brimful with 8 Gigabytes of content. These are not studio recordings, but reflect the nature and location of normal play. The original Masks recordings are in antique mono, while Orient Express is recorded in wondrous 3D Binaural Surround Sound. Both HotOE & Masks games at the highest quality MP3s available. Many hours of entertainment audio. Interviews with the game and adventure developers including Sandy Petersen (Call of Cthulhu), Greg Stafford (founder of Chaosium), Charlie Krank (former Head of Chaosium), Larry DiTillio (Masks of Nyarlathotep) and members of the Cthulhu Conglomerate (authors of Horror on the Orient Express). Quick Start Start Guide to Call of Cthulhu and PDF character sheets. Music by Alex Otterlei (HotOE) and Darkest of the Hillside Thickets. Photo Gallery and Player & Keeper interviews. Prop Documents by the H.P. Lovecraft Historical Society. Artwork by Earl Geier, Eric M. Smith, Francois Launet and others. "Best of" Yog Radio (including interviews with Robin "Wicker Man" Hardy & Bob "Dr. Phibes" Fuest). Post-game discussions by the players of both HotOE and Masks. Videos, handouts, previously unreleased extras and easter eggs! The Freeport Trilogy and Cults of Freeport gaming supplements by Green Ronin Publishing. 8 page full colour DVD booklet designed by the HPLHS.